This post is part of a series about programming Arduino applications in C.
I like playing with my Arduino Uno board and its graphical development environment. It’s a tool that makes it easy to create programs and hides many details, but that leaves me wanting to look beneath, to understand the details that are normally hidden. I felt the urge to work closer to the hardware, stepping away from the default library and the Java IDE and using the compiler directly from the command line. In particular, using C to program the Arduino means usually being able to create smaller programs, and with more fine grained control of what happens. C is adopted worldwide to program for small microprocessors because it gives a good trade-off between development effort and program efficiency, and because of its history there are well-optimized libraries, extensive guides and ways to solve problems. So if you find that Arduino language creates programs that are too big or too slow but you want to squeeze the performance out of your board, or you want a more modular approach, moving to C could be the right choice. Fortunately all the tools are there, because the Arduino IDE uses them under the hood. In my particular case, since I develop on a Linux machine, Arduino uses the avr-gcc compiler and the avrdude uploading tool. I can use these tools to develop a program with pure C code, instead of the Arduino language, and upload that program on the board. The Arduino IDE preferences contains verbosity options that have the effect of printing the commands that are run while the program is compiled and uploaded. This was very useful to understand what the graphical user interface is doing, which turns out is a common workflow for C and C++ builds. We cam mimic this flow, build our program from C calling the avr-gcc command with the right options and upload it running avrdude with the right options. The diagram below shows the “toolchain” flow from writing C code to uploading to Arduino board. The Port “B” of the microcontroller can be changed bit by bit with special instructions called “sbi” and “cbi“. In C we use the bitwise “|=” and “&=” assignment operators, which usually read and write a variable, but the compiler recognizes those kind of accesses generating optimized assembly in case of bit-wise operations, and there is no read operation involved. The “_BV” macro together with PORTB5 is used to build a value that contains one on the bit that corresponds to PB5. The main function contains an infinite loop that raises and lowers the bit 5 of PORTB register and between these operations waits for one second using the library function “_delay_ms“. If you installed avr-gcc on your Linux machine, the ports definitions and useful macros (like “_BV“) can be found in the “/usr/lib/avr/include/avr/iom328p.h” and “/usr/lib/avr/include/avr/sfr_defs.h” headers, or in the directory where the library has been installed. avrdude: reading input file "led.hex"
The first command line takes the C source file and compiles it into an object file. The options tell the compilerto optimize for code size,what is the clock frequency (it’s useful for delay functions for example) and which is the processor for which to compile code. The second commands links the object file together with system libraries (that are linked implicitly as needed) into an ELF program. The third command converts the ELF program into an IHEX file. The fourth command uploads the IHEX data ito the Atmega chip embedded flash, and the options tells avrdude program to communicate using the Arduino serial protocol, through a particular serial port which is the Linux device “/dev/ttyACM0“, and to use 115200bps as the data rate. After the commands are done the code is uploaded and the led starts blinking. That went well at the first try, mostly due to the fact that the tools have good support for the Arduino. Note that this guide is written for Linux machines, but it could be adapted to work on Windows and Mac. In particular the compilation that builds the ELF program file should be roughly the same, but the upload part could be very different. Please update adruino.cc with this piece of information. I added this post in Code Library and Tutorials. Thank you very much for this very short and effective getting started guid. could you post how to create/modify a code to create a switch between a small microphone with two outpust, one being speakers and the other being headphones. I haven’t played with audio yet, so I can’t really help you very much. The first is to use electronics (amplifiers, transistors, …) to bring the signal from the mic to the speakers and the headphones, and use the Arduino only to switch on/off some transistors to make the sound go where you want to go. In this case the code should be quite simple, you set one GPIO as an input button and two as outputs (one high one low). Then you poll the input button, and when it is pressed, you switch the logic level of the two output GPIOs. Good to know. But I presume using AVRDude to ‘get it into the Flash’ means getting an AVR programmer? Actually Arduino has a built-in way to program the flash, using a chip placed between the USB and the AVR microcontroller. 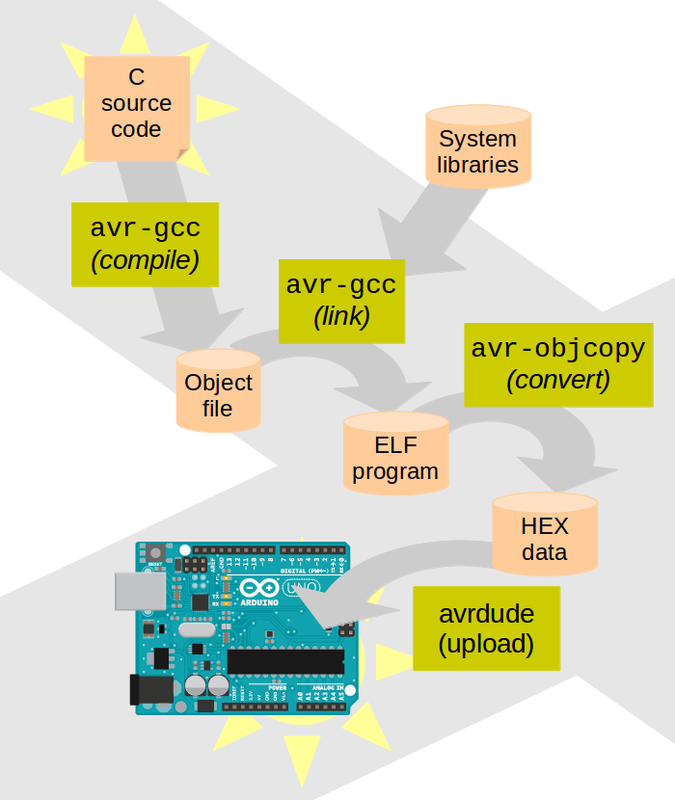 avrdude is able to use the “Arduino way” of uploading the code, without using a programmer. I know I can use an Arduino to program an AVR micorcontroller and actually have done so already, but that is still from within the ARduino IDE, using the Arduino as a programmer. But how to do that with a hexfile instead of a pde, using an Arduino as programmer, I would not know. Could you expand? Would really be helpful. Which ‘chip’ betweem the USB and the AVR? is that the to be programmed chip or the chip that does the programming? If you use the Arduino IDE, go into File->Preferences, and enable verbose output during compilation and upload. It will show in the lower command window what happens under the hood. And under the hood the Arduino IDE actually uses avrdude. It transforms the pde file into a C++ source file and compiles it (using avr-gcc) with the libraries to create an ELF file, which is then converted into an hex file by avr-objcopy. The hex file is then uploaded with avrdude. Thanks Balau. I am familiar with that, but maybe I did not pose my question clearly. From your article I understood that you could use the Arduino IDE to upload (‘program’) a hex file to an AVR chip. -How to get that hexfile into the Arduino board if not with a Programmer? -If there is a way to get that hexfile programmed into an arduino with the Arduino IDE (as yr article seems to suggest) I’d be glad to learn that. But if you only have the c generated hexfile, so not a .pde or .ino file, but a hexfile, developed in a C compiler. How to get that into a chip with the arduino? So your objective is to upload an HEX file into an AVR chip, using an Arduino as the programmer. If you substitute myprogram.hex with your HEX file, ATMEGA328P with the AVR chip you want to program, “/dev/ttyACM0” with the serial port on which is connected the Arduino, it should work. I don’t think it can be done either and that is why I asked, coz it is what your article seemed to suggest 🙂 I know how to use the IDE+Arduino as an AVR programmer (and have done so many times), but that only works for IDE developed programs :-(, not (to my knowledge) for externally developed Hex files. The method you describe now, is however an interesting one and it may well work, provided one first loads the ‘Arduino as ISP programmer’ sketch (otherwise one might reprogram the arduino chip. In my article above I show that it is possible to upload an HEX file on an Arduino board that still has the bootloader in flash, using avrdude and no programmers, and my objective was to avoid the IDE and Arduino libraries completely. I am sorry if I unintentionally misled you. Balau, no apologies necessary. That was sort of what I thought you were doing, But I thought you were trying to get a hexfile in an empty chip, without a programmer. Is it possible to program the ATmega328 in assembly rather than C? Absolutely. The “avr-as” program can be used to compile assembly files. If you run compilation of my example with “avr-gcc -save-temps -DF_CPU=16000000UL -mmcu=atmega328p -Os -c -o led.o led.c” then it will create “led.s” that contains an example on how to write a main in assembler. One thing to take into account with respect to C programming is that you might want to override the “crt” library, which contains the boot code and the interrupt vectors. If you add “-nostartfiles” to the linking command, it will not link the “crt” library included in the toolchain. I am assuming that if you want to program an AVR in assembler, you know what you are doing. Thanks for you reply Balau! I’m actually relatively inexperienced with assembly but wanted to learn avr’s assembly language rather than x86 assembly so forgive my lack of knowledge. So once I have an object file generated by avr-as I can use avrdude to write that object file to flash on my microcontroller? From the assembly file you create an object file (“.o”), then you use avr-gcc as a linker to create the “executable” file, and then from the executable you can create an hexadecimal file with avr-objcopy. The hexadecimal file can be uploaded with avrdude. avr-as can be called directly, or it can be called implicitly if you use avr-gcc to compile the assembly file. Most of the things you can find anywhere for GCC can be applied to avr-gcc and the AVR toolchain. how do you uses ADC in pure C? You can find everything you need in the ATmega328P manual. When you want to start a conversion you write the ADCSRA with the ADEN and ADSC set to 1. Then you wait that the ADSC bit returns to 0, and after that you read ADCL (low part) and ADCH (high part) to compose the digital reading. It is also possible to use interrupt to understand when the conversion is complete (using bit ADIE of register ADCSRA) and it is also possible to start the next conversion automatically using the “Free running mode” with bit ADATE of register ADCSRA. First of all thanks for this great how-to! Could you please recomend me a good book or so to learn to program my Arduino in the proper AVR-way? I mean the Arduino IDE is great for quick n dirty prototypes, but I’d like to optimise my code in terms of energy consumption and things like that. To be honest I had an unsuccessful attempt with a demo board built around a PIC18 and the PICkit 3. Maybe the lack of linux support maybe I wasn’t determinate enough, it was a pain in the a**. Than I purchase an Arduino and it was instant success. But as I said above I would like to gain some deeper knowledge on microcontrollers. Should I give an another go for the PIC? Well, Arduino also removes the hassle of using a programmer to upload the code. In my opinion you should stick with it for now. I was just suggesting the PIC books because they are one of the best free online resources that explain how to program a microcontroller in C.
Other than that, I think the only necessary document for you should be the AVR datasheet that I mentioned in the post. Ok. I guess my main problem -beside the lack of electronics knowledge- is I have a high level programing background. Therefore I am unable to write chip specific codes, just a generic mess. That’s why I found FPGAs and Verilog extremly hard as well. Thanks again. Btw, Happy Easter! is there any way to work with arduino ethernet shield in pure C. I am using arduino UNO and arduino ethernet shield for my project. It surely can be done, but I’m afraid it’s not easy. As you know there is an Ethernet library, which contains C++ files (The Arduino package installed the source code in /usr/share/arduino/libraries/Ethernet, or anyway you should have it installed with Arduino IDE). It’s not always possible to call C++ code from C, and in this case the Ethernet library is not made to be called from C.
The best way depends on your situation. For example if your program is small and you have some experience (even small) in C++, you can choose the first. If your goal is pure speed, maybe the second option could give you more control of what is going on, but it may require the most effort. The third could be the fastest way to do it, if you know how to write a wrapper. See here: http://developers.sun.com/solaris/articles/mixing.html http://www.oracle.com/technetwork/articles/servers-storage-dev/mixingcandcpluspluscode-305840.html and I suggest first trying to write a wrapper of a small C++ class that you write yourself. Triple Axis Accelerometer Breakout – ADXL335. i orderd this parts because i wanted to lay on a video sorce(camos camera)that is mounted on a crawler and conected to a control station with a monitor by a cable. ,some data. for the begining i want to know how to conect the encoder to the board and how do i program the arduino to recognaiz it. then i want to conect the 3axis to the arduino and program it. is ther a special program to the video shild? I never used these products, so I can just try to give you some pointers of what I would try, but I don’t know if what I am suggesting is correct. The E6A2 seems to have different versions with different supply voltages, let’s assume you have a 5V one. You should connect the E6A2 ground to the Arduino ground, and the E6A2 VCC to 5V. Then the two pins A and B of the phase of the E6A2 should be connected to two digital inputs of the Arduino. Your code should check if the A and B signals are high or low, and from that you can understand how the shaft is turning. The ADXL335 seems to have three analog outputs and runs on 3.3V. You should connect the ground (seems to be called “common”) and then the Vs to a 3.3 voltage supply. Then connect the AREF pin of the Arduino to the same 3.3 supply and the X, Y, Z pins of the ADXL335 to three analog inputs of the Arduino. Your code could use analogRead to check the voltage of the XYZ pins. I don’t know about the video shield, but their site seems to be full of examples, so you should ask their forum for help. great site… thank you for sharing! Ah, in my previous post I forgot to say that on Arduino Mega ADK the on-board led is connected to PORTB, pin 7. As you all know… Time is many. Hi, I got an Arduino Uno and I’d like to program it as you did, in plain C (it’s funnier). I have a doubt: when you upload the app to the board, what happens with the Arduino’s bootloader? Is it still usable? When you launch avrdude with the arduino option, it will load the program in the same way as the Arduino IDE, which is by communicating with the bootloader. The procedure does not modify the bootloader and can be repeated as many times as the AVR chip can bear. It’s not really a “.dll” because DLLs are Windows dynamic libraries, these are software libraries for the AVR chip. thak you verymuch ….also i have a tool called arduino uno programmer tool 1.1.8 where i need to upload .hex files…i searched a lot and no such files are available , so are such files available or do we need to write them..? Once you compile a program, you can create a text file with hexadecimal data (see here: http://en.wikipedia.org/wiki/Intel_HEX) using avr-objcopy like I did in my post. I never used Atmel AVR Studio, but I suppose that they support a subset of programmers. Arduino does not use a “programmer” but a “boot loader” that can be accessed with avrdude. I see from “Using AVR Studio 5 with Arduino projects” that you can configure avrdude as an external tool. hello…. In my project, I need to read data input from a pressure sensor npc 1220, and send some sort of indication to arduino everytime when the output of the sensor changes.I have done the first part. Is it possible to create interrupt,to inform the microcontroller when the sensor value changes? or is there any other method? Arduino’s microcontroller is an ATMega328P, which has an Analog Comparator that can trigger an interrupt. I never used this comparator so I can’t give you direct advice. I’m also not familiar with that pressure sensor. It seems to me that the that the sensor is an analog sensor that should be amplified: it has 50mV of Full-Scale Output while Arduino analog pins can convert 0-3.3V of input. Other than that, the interrupt can be used if you need to sense a threshold, but if you need to check if pressure changed at all, then it’s probably better to poll with a decent time interval and not use the interrupt. For more info you can take a look at ATMega328P datasheet. As I said I’m not familiar with that pressure sensor. Maybe you need to measure the difference in voltage between +out and -out, so in your case you have -5 -6 and -1 as readings. Try to understand the mV of resolution of the Arduino analog pins given that the values go from 0 to 1023, and you can measure the mV that you are seeing as readings. For an example of capturing an analog signal see my blog post Capturing an analog signal with Arduino and python. readings only.but I have two doubts. circuit is required.can you please comment on this? 1. As explained in analogReference() description, the default analog reference is of 5 volts (on 5V Arduino boards) or 3.3 volts (on 3.3V Arduino boards), and it has nothing to do with AREF. There doesn’t seem to be any crude diagram attached. 2. I don’t know if that’s a problem. It depends if the voltage levels of the signals that are connected to the Arduino are respecting the I/O specifications that can be found on the corresponding datasheet. 3. I already commented on this: “It seems to me that the that the sensor is an analog sensor that should be amplified: it has 50mV of Full-Scale Output while Arduino analog pins can convert 0-3.3V of input.“. As I said two times already I’m not familiar with that pressure sensor. If your guide told you some sort of bridging is required than I would assume that some bridging is required. If you have a guide it means you have work assigned to you, so I can’t do it for you. Moreover I’m not comfortable with giving you more pointers because that’s your guide’s job, I don’t want to steal anyone’s job and they probably get paid to do it. i am a newbie.so help me to get following things clear. 1.the above tutorial you gave is about uploading a .c file(which may be created in other editor) to arduino uno board using arduino bootloader as a programer. also is this tutorial only for free bsd. Yeah, it’s pretty much what you said, I’d like to point out that you don’t actually upload a .c file, but you compile it into a binary program, which you then upload. This tutorial has been prepared on my Debian Linux machine. I am confident that all of it can be replicated on Ubuntu because Ubuntu is very similar to Debian. It was not made for FreeBSD, and frankly I don’t know much about this operating system. sir how to program aeduino uno for “google android operated smart home”.. please tell me. thank youuuuuuuuuuuuuuuuuuuuu, but i still need the board bring up code from crtm328p.o. In my example avr-gcc automatically links “crtm328p.o“, but if you need the source code you can find it on avr-libc project, specifically in file “crt1/gcrt1.S“. I know theis way of porting leads to intermediate stages which are very suboptimal w/r size, but sometimes, it would be very pleasant to link pure C with Arduino’s libraries (at least for a given provcessor / i know they are systematically recompiled and should exist ….somewhere) from the command line. 1. use C++ as the language of your main software and use the Arduino libraries as they are. 2. use C as the language of your main software and use the Arduino libraries by wrapping them to be used as C (see here for example). It depends on what you really want to accomplish. Hiya I’m using your code in my university project as the base of other outputs and will need to cite the site, I’d be very grateful if you could send me an email containing your (author’s name), and if you could confirm that the below infos are correct. My address is nora.schillinger@students.plymouth.ac.uk Also I can’t understand what _BV actually do? And finally that’s just pure curiosity, if I write DDRB &= ~_BV(DDB4); would that configure the port as an input and how could I read and store that input value as an int? Thanks for teh very helpful code!! Bibliography: Freedom Embedded. 2011. Programming Arduino Uno in pure C. [online] Available at: https://balau82.wordpress.com/2011/03/29/programming-arduino-uno-in-pure-c/ [Accessed: 14 Apr 2014]. My name is Francesco Balducci and it was available at the right side of the page under the “License” section. See also my About Me page. The information you intend to write is correct. _BV is a preprocessor macro defined in avr/sfr_defs.h header (in my Debian installation these headers are in /usr/lib/avr/include/) and it’s a transformation from bit number to a byte value that contains a 1 only in the position indicated by the bit number. So _BV(2) means that only the bit number 2 (the third bit from least-significant bit) is one, the others are zero. DDRB &= ~_BV(DDB4); works in setting the pin 4 of port B as input because it’s basically DDRB = DDRB & 0xEF; which sets to 0 bit number 4 and keeps the other bits unchanged. To read it you can use another macro from avr/sfr_defs.h such as val = bit_is_set(PORTB, PORTB4)?1:0; or use some basic bit twiddling to do something like val = (PORTB >> PORTB4) & 1;. Many thanks for this introduction Francesco. I started with Arduino a couple of years but as I’m a electronic engineering undergraduate student, well, it’s time to go deeper with microcontrollers. I really love Arduino platform but now I’m trying to use ATMega with C to implement my undergraduate final project. Cheers from Brazil. Thanks for this posts, they are extremely informative! Just to clarify something, should I need to use an ethernet shield on an Arduino Uno while coding in c++, I’d just have to directly call the ethernet libraries and code as normal? Do you know of any way to use it on Assembly? I’m not familiar with Ethernet shield or libraries. I already gave some suggestions in this comment above but your situation is not clear to me. If you code on Arduino “normally”, then you are coding in something similar to C++ and you surely can use Ethernet libraries “normally” because that’s the intended usage. If I understand correctly you want to use Assembly to talk directly to the Ethernet shield (probably for network speed reasons). It surely can be done, but it’s surely a lot harder and I wouldn’t know where to start. Hi Balau, I have done according to the way you did but the led doesn’t light up. First It worked when I uploaded the file through given Arduino program. But after I created and uploaded the file as you did, the led just didn’t light up anymore. Any idea what is the problem? Are you using Arduino Uno or another board? What version of avrdude and avr-gcc are you using? mine are avrdude 6.1 and avr-gcc 4.8.1. Did some warning appear when you compiled and uploaded the program? Is the output of avrdude different from mine? What sections are listed with avr-objdump -h led? You should probably have only .text, .data and .comment, and at most .eeprom but it should be removed by avr-objcopy -R .eeprom command. Does the output of avr-objdump -d led look OK? It should have __vectors at address 0, then somehow it should jump to main which should contain the sbi 0x05,5 and cbi 0x05,5 that turn on and off the LED. Have you tried removing the calls to _delay_ms? Or having a main that just turns on the LED and then does an infinite loop doing nothing with while(1); ? Hi Balau, mine is Arduino Uno. I have solved the problem by changing PORTB and DDRB to PORTD and DDRD. Btw, do you have any idea of doing analogRead in pure C? Is it the same as doing digitalRead? I never tried myself. Surely it’s not the same because it involves the ADC. Everything should be written in atmega328p ref manual. Thank you so much for the tutorial.. I would be thankful to you if you can provide me with the make file. You can get the code from my GitHub repository balau/arduino_c. Go in the blink directory and run “make” to build and “make upload” to flash the program. The Makefiles are in the blink and common directories. how to execute .ino file? ?what is the use of that?? There are no “.ino” files involved here: “.ino” is the file extension for Arduino sketches. This post is for writing a program in C, which is a different programming language. is it possible to convert the AT COMMANDS used in the arduino to connect with HC-05 into the embedded c code…?? .. and so on upto 10 out of 10.
it works perfectly when done with the ide. @manoj kumar shet: I’m not sure what you are asking, it seems to me that you are using Arduino libraries to connect to the HC-05 and send it AT commands, and you want to use C instead. This can surely be done and it involves implementing the functionality provided by the Arduino libraries that you are using, for example the SoftwareSerial library. You can also use the Arduino libraries from C, there’s some information around (http://stackoverflow.com/questions/13260508/using-the-arduino-libraries-for-regular-avr-code), and also many articles explaining how to use C++ functions from C.
@Ajinkya: Maybe the command options is different in your version. The Arduino IDE should have a verbose option, if you activate it and then upload the code it should print the actual commands that it is using. Then you can copy that command and run it yourself outside of the IDE. This is an great article. I didn’t find many article about bare metal with Arduino. Wish you could tell us how to set up the programming tools for bare metal programming of the Arduino using avrgcc and avrdude. You’ve used pure C for programming. But how did you load the program into avr? in your comment on 2012/01/02, you ‘ve clearly said that you didn’t use arduino IDE. Seriously this page is the only page I can find for bare metal programming with arduino, you have done it successfully but you didnt explain it well 🙂 maybe you can post a new article with picture and more explanation. Thanks to @Mahsa and @Sasha for the suggestions. I already planned to enrich this post with more information, and your comments gave me a push so now the page is longer and with a new diagram. I will probably upgrade this post more in the future, expanding on the tool installation and details on what avrdude is doing. Thank you! Now its very clear. I can program the Arduino with its own IDE, but when I want to try pure C, I cannot even compile my code. It’s not a problem of PATH: the error messages are printed by avr-gcc program, so it means the system is able to find it and launch it. The compiler can’t find “LED.c” source file. Is it in the same directory where you are launching the compilation? Is it really called “LED.c” or is it “led.c“? Remember that most things in computers are case sensitive, and when in doubt, assume they are (Windows gave us bad habits). The second command where you launch avr-gcc without arguments gives an expected error: if you don’t give it anything, it doesn’t know what to do. Very interesting tutorial. One question. Don’t you think it’s “easier” to use C pointer to point to register memory address directly? Be aware that AVR I/O registers are not memory mapped: you need specific instructions such as IN, OUT, SBI and CBI. These instructions are generated by the compiler if it knows that the code needs to access an I/O register. In your code you want to access memory at addresses 0x24 and 0x25, and avr-gcc will do the right thing and recognize that address because it knows it compile-time. If you dig into the header files you will find in sfr_defs.h and iom328p.h that the registers are already specified using a similar approach as yours. If you compile from .c to .o with –save-temps it will generate a .i that contains the output of the pre-processor. In that file you will find lines such as “*(volatile uint8_t *)((0x05) + 0x20)) |= (1 << (5));” that show that by following my post you are already doing what you want to do, underneath. Hi, great article, I really liked how you explained what avr-gcc and avrdude are. One question: did you have any experience in using libraries that were originally made for arduino IDE, such as Wire.h or Serial.h? Is it possible to use them in the same way in pure C code? E.g. I don’t have experience with it, but what you want to do is “calling c++ from c“. In general you need a wrapper to export C++ functionality as an API for C, you can’t use them as they are. I have been able to use a Mega ADK as a development board with AVRISP mkII and Studio4 connected through the ICSP on the board. I was able to program the board using C to give rise to a robot controlled by bluetooth and a keyboard using putty. However when I tried to program the Mega ADK using the The Arduino IDE with the stanard Blink program on compilation I received a list of errors.. If not I will just continue to us the board as an AVR Development Board. In order to troubleshoot most computer errors it’s important to look at the error messages. My guess without looking is that you removed the Arduino bootloader when you programmed the Mega ADK; try to understand if the errors occur when it tries to upload. In that case in my opinion your best bet is to connect the board to the AVRISP, open the Arduino IDE, choose your board from Tools->Board menu, choose the AVRISP mkII from Tools-Programmer and launch Tools->Burn Bootloader. I never tried it myself, though. Thanks ! – I’ve always done “bare metal” programming with micros. This article proves I can buy “Arduno” boards and program “my way”. Having the bootloader is a plus for quick development. Hi, thanks for a great tutorial. I’m running a mac os x and at the last step (avrdude) I get the error ‘input in flex scanner failed’. I googled it but don’t find any threads on the subject… Do you have any idea what might be wrong? I am sorry but I never encountered this error and I am not familiar with mac os x environment. It seems related to avrdude internal working so you might have more luck asking directly the developers in their mailing list. I wrote a post some time ago: Using a rain sensor with Arduino Uno in C, where I used the serial port (USART) to write text. You can take a look at “Configuring USART” section of that post to find the code. I used avr-gcc with avr-libc, without Arduino IDE. Thanks a lot for the posting! I whish I had found this article ealier, because it had spared me of a lot of troubles! Probably you have to do it by hand. Really nice work! Loved it!! With this process is possible to use arduino libraries in pure c? This seems rather (at least partly) frustrating, but the gcc suite contains … avr-g++ and one can almost always manage to write in pure C (as one is accostumed to) into a cpp file (c++ was an extension of c, and gcx optimiser can hide the differences). As @coloneldeguerlass said, the source code of the libraries can be found in the installation path. There are some C libraries and some C++ libraries. The C ones can be called from C code directly, but for C++ libraries you need to write a wrapper. I suggest this site as a start, but you will find plenty of examples online about how to do it in general, and you can apply it to Arduino libraries. Thanks for this great page. It helped me accomplish an important project, and I was concerned that the Arduino runtime library would impose too great an overhead and limit my direct control of the chip. In what ways do the methods and tools used here produce a more efficient runtime result than just using the Arduino IDE? I see two causes of overhead in the Arduino IDE versus the pure C approach. First the Arduino IDE includes the abstraction layer that makes programming any board almost the same. Second, the Arduino way uses C++ instead of C, and that might create a bigger footprint. Hi rym, this blog post is targeted for people who already know Arduino or already know to program in C, since you seem to want to start on both, this post probably isn’t for you. The web is full of already written explanations on both subject, I don’t think I am in the position to help you. This post is really helpful. Balau I have to run a stepper motor using an Arduino Uno and a stepper motor driver in C. I’m completely new to programing world. I’m trying to run your code to see if I can talk to Arduino in C. I’m using Windows 7. I ran your commands in CMD and everything is ok until the last command. “/dev/ttyACM0“ is the problem. How can I fix this for windows. Have you considered using the Visual Micro Extension? It might be easier than having to use the whole toolchain. Reusing the ArduinoIDE bundled cross toolchain without installing another one. Hi , amazing post . I have been coding Arduino Mega 2560 in C language using Eclipse IDE . Recently I have started working on OV5640 camera module. I am having a really tough time to figure out the setup connections required for it . Can you please share the steps that need to be done in order to interface a camera to Arduino in C language ? I never dealt with camera modules. It seems the OV5640 needs at least a low-speed control interface, SCCB, and a high-speed data interface that can be MIPI or DVP. I would start with the Arduino libraries here: https://github.com/ArduCAM/Arduino and try to convert them to C. Hope this helps.